The Executive MBA (EMBA) curriculum focuses on experiential, integrated learning. These 5-day intensives, targeting development of an executive mindset, open and close each academic year. Executive Forum I—personal leadership foundations and principles of strategy formulation, a Houston residency program. Executive Forum II—applied strategic and critical decision making in the context of the functional skills acquired in the core. Executive Forum III—enterprise-level strategy formulation and execution and leading the organization in change. Executive Forum IV—an international management off-site intensive caps the global core and the MBA for Executives program. The executive seminars run throughout the program, providing a channel for integrating concepts across the disciplines as well as for executive skills development such as negotiations, communications, team dynamics, executive coaching and career coaching. The final executive seminar provides a C-suite perspective, focusing on corporate culture, business ethics, and corporate governance. These seminars feature an executive speaker series to provide first-hand insights from a wide spectrum of business leaders. The core curriculum focuses on providing you with the analytical skills necessary for robust critical decision making and with the depth of functional knowledge necessary to lead across the organization. 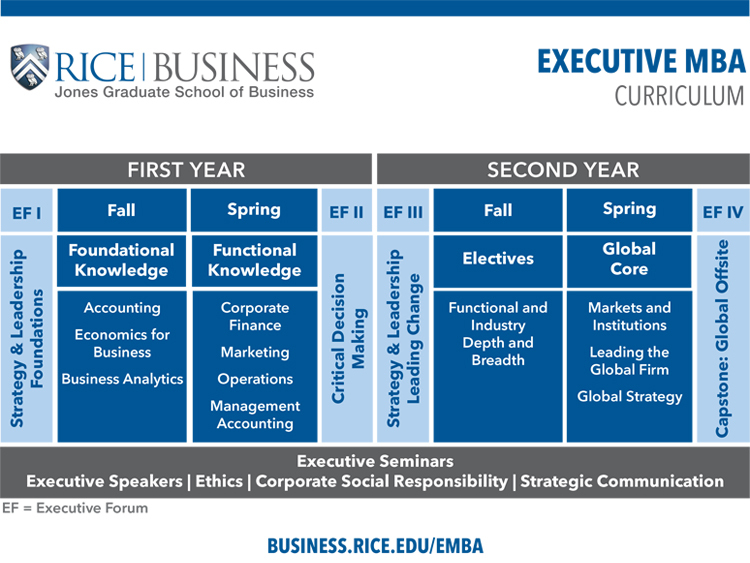 The Rice MBA for Executives program is well-grounded in economics, business analytics, accounting, finance, marketing and operations. In the third semester of the program, you are able to customize your MBA program by choosing from a set of electives that deepen your general management expertise or tilt the program towards advanced courses in specific areas. The global core curriculum in the final semester of the program focuses on creating the awareness and mindset to effectively lead in global financial, resource, and consumer markets. The global management course incorporates cross-cultural leadership skills, managing an international labor pool, complexities of business government relations and nuances of strategy for the multi-national enterprise. The global markets course covers the economic environment of business, marketing to a worldwide consumer base, and raising capital in global financial markets. You and your classmates will bring together the many facets of global business in the Executive Forum IV, an off-site capstone that takes place internationally. Throughout the program you will work with an experienced executive coach to fill identified gaps in your leadership portfolio. Each executive coach provides support in formalizing a personal strategic development plan and executing on that plan. The coaching program complements the leadership development curriculum, providing a safe environment for challenging assumptions and promoting new thinking. You will also have access to custom communications coaching and to career counseling to develop targeted career development tools. In addition, the business school’s Career Development Office (CDO) successfully partners with students and alumni to meet their professional development goals. A health care specialization track is offered as an enhancement to your degree. This health care track is aimed at health care professionals working full time who are seeking to advance themselves in the industry. The health care courses are offered year round and supplement regular electives.